On 17 September, 13 fellows – seven women and six men – graduated from the UNU Land Restoration Training programme’s (UNU-LRT) six-month training course. Held annually in Iceland from March to September, the training is an intensive postgraduate course on ecological restoration and sustainable land management, designed for professionals from developing countries that face severe land degradation. The training provides detailed study of the theory and practical aspects of land restoration, in addition to participants carrying out a project of their own under the guidance of land management professionals in Iceland. At the graduation ceremony UNU-LRT Director Dr Hafdis Hana Aeggisdottir, Mr Stefan Haukur Johannesson (Iceland’s Permanent Secretary of State), and Mr Sveinn Runolfsson, (Chair of the UNU-LRT Board) addressed the fellows and guest. 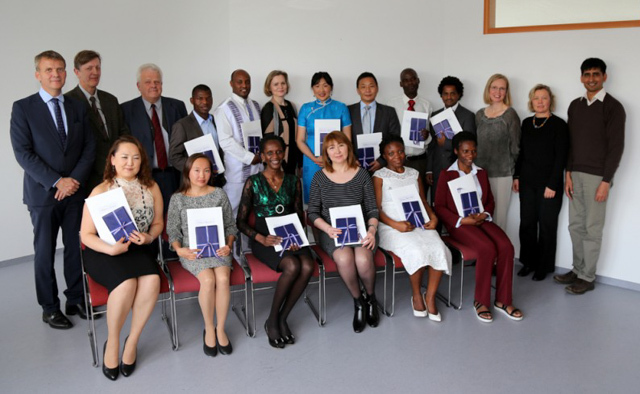 Addresses were also given by two graduating fellows, Ms Uuganzaya Myagmarjav from Mongolia and Mr Emmanuel Chidiwa Mbewe from Malawi, who spoke on behalf of the 2015 cohort of fellows. A common theme in the graduation addresses was the importance of UNU-LRT efforts in halting land degradation and restoring degraded land. The fate of the human population is closely tied to the land, as is reflected in Goal 15 of the new Global Goals for Sustainable Development. Halting and reversing land degradation will also help achieve many of the other Global Goals, including increased food security, poverty reduction, better water management, as well as mitigating climate change. Since the launch of the Land Restoration Training Programme in 2007, 76 experts (including 37 women and 39 men) from UNU-LRT partner institutions in 11 countries in Asia and Africa have graduated from the programme.